We supplied a total of 650 Trackway panels to the solar farm site, which were used to cover all of the entries and exits to the site. 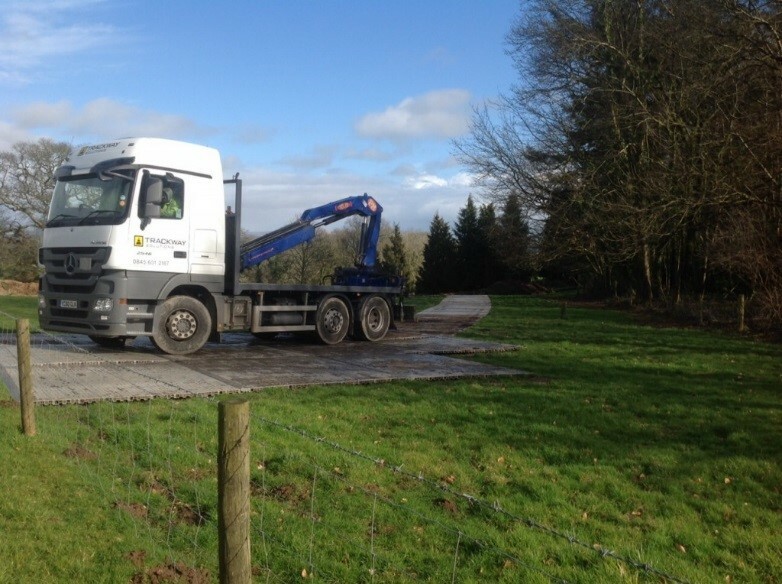 It was a relatively short hire, with the trackway panels being down on the site for around six weeks, but the job went really well, and our customer was very happy with our service. A solar farm is a large scale collection of solar photovoltaic (PV) panels to generate renewable energy. They require quite a large area of land, so they tend to be developed in rural areas where there is plenty of open space available. PV panels convert sunlight into electricity, where it is then fed into the local electricity grid via inverters, which change the current from DC to AC. Many people think that solar panels are pretty useless in the UK, where we don’t get much sunshine throughout the year compared to Mediterranean and tropical countries. However, solar panels can also generate electricity when the weather is overcast or cloudy, making them perfect for use in the UK. Around 50 acres of land is required for every ten megawatts capacity of PV panels, which is enough electricity to power 3000 homes and save 4300 tonnes of carbon dioxide per year. Solar farms provide a fantastic way of producing electricity in the future when our reserves of coal and oil eventually run out, and we’re thrilled we could play a part in the development of this one.